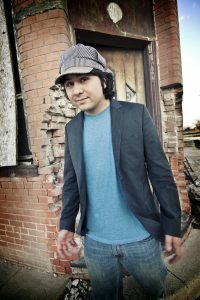 One of the regional music scene’s freshest faces, Tyler Cannon is throwing his trademark hat into the ring as a young man already a few years into being a singer, songwriter, and performer,adding “recording artist” to his resume with the summer 2011 release of his debut Look At Me. A punchy, melodic shot of guitar-driven rock & roll and plainspoken Texas country, it’s a promising first step but in another way a culmination of Cannon’s musical journey. Growing up in the coastal Texas town of Kingsville, Cannon soaked up the influence of his parents’ diverse record collection for as long as he could remember, everything from dancehall-friendly classic country to platinum-selling rockers like The Eagles and the Steve Miller Band to the pop-punk and hard rock he picked up on once he was old enough to seek out his own records. Trips to Corpus Christi’s Executive Surf Club venue not only broadened his horizons but also put music closer to his heart; not only were new favorites like Roger Creager and Phil Pritchett making music he could relate to, they were also life-sized examples of how a local guy with guts, talent and creativity could succeed as independent, label-defying young artists. He spent most of the next several years with a guitar in hand, developing enviable rhythm and lead chops and learning to write colorful, catchy original songs. Soon backyard jams for friends and family turned into open mic appearances, and open mics translated into booking gigs as he spent time in the Brazos Valley and the Hill Country, befriending and sharing stages with artists including Pritchett, Little Brave, Zack Walther, Mike Ethan Messick, and Ben Morris & The Great American Chorus. He became a regular at venues in San Marcos, New Braunfels, Bryan, and College Station, occasionally finding his way into bigger markets in Austin and Houston and even fulfilling one early wish to play at the Executive Surf Club for himself. As his talent – and the buzz about it – grew, Cannon was able to pull together the resources to not only make an album but make a bold, tuneful statement with the help of respected musicians like David Grissom, Bukka Allen, Allan Goodman, Matt Briggs and producer Pat Manske. Artists that had lent their talents to some of the greatest recordings in the history of Tyler Cannon’s beloved Texas music were now helping him realize his first milestone. Fresh and energetic, with the confidence of several years already in his back pocket, he’s ready for bigger stages and bolder steps in his promising new career.